Database for the home hub. When you have all your sensors, actuators and impulses configured, and you have defined all your rules and collected a number of months worth of statistical data, the last thing you want is for a crash or gremlin to corrupt your database. The software can be rebuilt with relative ease, but restoring the configuration might not be so easy. What we require is a nightly database backup, to a separate location that will be safe should our Pi come to any harm. I am using a shared directory on my NAS drive, but a small USB drive would be just as good. If disaster should strike you can restore to a known good point. In a future series of posts I will be investigating voice control for the hub, using integration with the Google AIY Voice Kit. 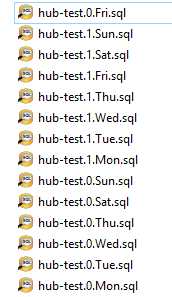 Now we have a working database server, we can create and populate the hub database itself. This is the first of a number of commands that use wget to download files from the project repository. After confirming your postgres password you should have a hub database containing 16 tables (some populated with basic data), plus a number of supporting views and functions. We will examine this schema in the next post. PostgreSQL is described as the world’s most advanced open-source database, and underpins a number of features of the home hub. It runs quite happily on the raspberry pi. There are three areas that require configuring, in order to allow the controller and website scripts to access the database. In addition, we should include access from our desktop PC, which will allow us to administer the database using the management tool pgAdmin. Uncomment and modify the listen_addresses connection setting and change the value to ‘*’ to listen on all interfaces. Save the file. Restart the database server. The next task is to edit pg_hba.conf to enable connections from localhost and your PC. save the file, and reload the configuration. The final task is to set the postgres user password. Replace ‘raspberry’ with your chosen password. 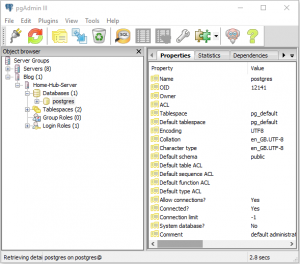 sudo -u postgres psql -c "alter user postgres password 'raspberry';"
You should now be able to connect to the database server from pgAdmin running on your client PC. In the next post we will create a skeleton database.